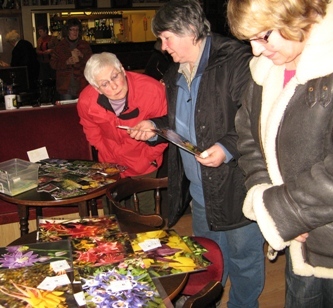 ABOUT CARRIE THOMAS: Carrie is a keen plantswoman, particularly interested in sowing seeds of unusual, gardenworthy plants, sowing several hundred types each year. 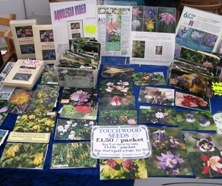 Her seed company, Touchwood, supplies seeds of cottage garden favourites as well as rarely offered items. A gardener since a young child, her passion for plants really took off when she had her first house and garden. Carrie is a qualified teacher, and has an honours degree in Botany and Zoology from Swansea University. 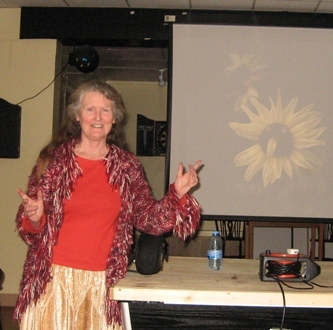 Her fascination in how plants work allows her to offer several talks and workshops with a strong biological content. 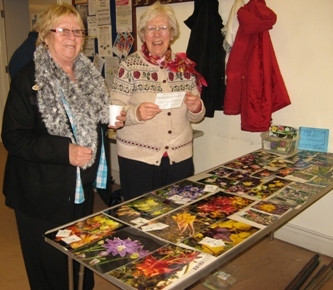 She also offered people a chance to see flowers close-up under the microscope during 'Close Encounters with Plants' workshops in the National Botanic Garden of Wales. 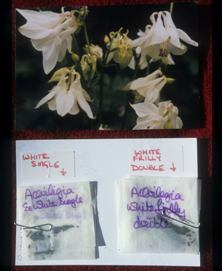 As a young child, Carrie became intrigued by granny's bonnets (Aquilegia, columbines) and now holds TWO (Plant Heritage) national plant collections of Aquilegia. Carrie has been offering a wide range of gardening talks for many years now, and has lectured for the Royal Horticultural Society, Plant Heritage, the Hardy Plant Society, the Cottage Garden Society, the Horticultural College at Pencoed and at Gardener's World Live. What talks does Carrie give? Please scroll down for full details. When is the best time of year to give each talk? Some work at any time, others are more seasonal. I give a calendar guide using the initial of each month: (O)NDJFMAM(J) means the talk works best when given between November & May, & possibly late October or early June. This talk looks at how to create an authentic cottage garden. Topics include hard surfaces, structures, ornamentation, and the kitchen garden, then shows a selection of cottage garden plants. What are some of the quintessential cottage garden plants? How have they developed over the centuries? Annuals, biennials, perennials, and bulbs are all discussed. The cottager relies on the garden to provision the family, so, yes, we will be looking at the kitchen garden, and exploring ways of storing the harvest. But we’ll also delve into the herb garden, and look at the productive side of flower growing. Information, ideas, recipes and plenty of inspiration! How to encourage a wide range butterflies into your garden. 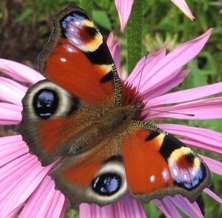 The talk illustrates various butterflies, discusses their needs and shows a variety of suitable flowers. SLUGS, APHIDS, and SPIDERS! Any month is suitable. I’m both fascinated by, and frustrated by, some of the smaller creatures in my garden, and I expect you are too. Here I offer insights into their lifestyle and offer some intriguing ways of dealing with them! Arachnaphobes may leave early (to make the tea?) if they can’t bear to see the wonderful slides of these extraordinary creatures. BOTANICUS TONGTWISTII ‘Give Up’: LATIN NAMES, WHY BOTHER? Any month. Sooner or later all gardeners are faced with Latin plant names, this talk helps ease what may be a difficult experience! It tackles the why and how, before giving loads of ‘easy’ examples. You already know more than you think! There’s also an open-book fun quiz to finish off. Learning names has never been so enjoyable! Share the delightful and cunning ways that flowers invite pollinators, and see the incredible mechanisms for ensuring pollination! A wide variety of flower structures will be shown on slide, and their function discussed. Flowers will never look the same again! With all their secrets revealed, flowers become more fascinating than ever. I like to offer this with a workshop session afterwards when people can explore flower structure themselves. This talk looks deeply at the structure and function of flowers, but with a view to understanding how to breed new varieties. It then introduces the subject of genetics, explaining cross pollination to form new hybrids, and ‘dominant and recessive genes’, and ‘f1 and f2 generations’. Examples of plant breeding shows what you may achieve in your own garden. Plant movement fascinates me, and I’m sure it does you too, or will do so after this talk! There is such a variety of movements, some rapid, some slow, but all intriguing. Soon you, too, will be experimenting in your garden! Either done as a talk or in a discussion format, with slides. 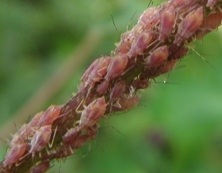 The talk looks in detail at sowing seeds and subsequent care until flowering size. Focusing on hardy perennials and including grasses, trees & bulbs, with examples to entice and encourage. Optional: sowing fern spores. Looking briefly at how to sow hardy perennials, and grow on until flowering size (often the next year). Then follows an extensive collection of suggested plants. Interesting, unusual and inspiring! 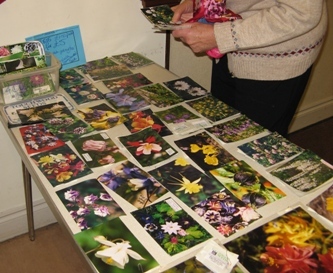 Looking briefly at sowing seed and aftercare, this talk then looks at unusual (mainly hardy) annuals, biennials, woody plants, bulbs and ferns. Something for everyone’s tastes. My wonderful collection of Aquilegias at Touchwood includes the NCCPG Collection of Aquilegi vulgaris cultivars and hybrids (May, early June). This talk will get you hooked on these easy-to-please cottage garden stalwarts. The range of colours and flower shapes is extra-ordinary, and now we also have coloured leaves and scented forms to choose from. 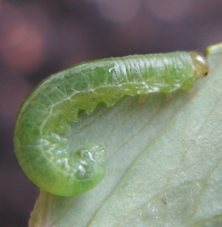 Covering pests, diseases, breeding techniques, with full sowing and growing techniques discussed, and masses of slides showing named and unamed forms - you’ll hardy believe your eyes! This is definitely NOT a talk on 'floral art', or even one for the flower arranger! Instead it’s for everyone who likes bringing in flowers from the garden to enjoy….and especially for everyone who would like to do so but has never quite got started! Ideas on how, & plenty of plant ideas. Aren’t flowers wonderful? Yes! …..but, oh, so often short lived. This talk looks at extending the season of interest by growing plants that have interesting buds or pods……or both! FASCINATING FOLIAGE Any month is suitable. A look at the use of foliage and foliage effects in the garden. Suggesting plants from the common to the rare, and effects from the easily copy-able to great living flights of fancy sculptured from plants! How did your garden grow in 2001? This talk is a sumptuous journey through 2001 as seen through the eye of a camera. Views of various local gardens portray the changes through the seasons. With 350 slides to be shown, this talk is not to be missed! Photo shows Touchwood aquilegias being filmed for Gardeners' World TV. A follow-up to the popular 2001 talk. The same gardens (different views) are followed through the year. With 350 slides to portray the changes over the twelve months. CREATING A GARDEN FOR WALES Any month is suitable. A story of the creation of Middleton, the National Botanic Garden of Wales. A wonderful and ambitious project encompassing the best of Millennium initiatives, design, conservation, gardening, plants and education, all within the magnificent setting of an historic site in <?xml:namespace prefix = st1 ns = "urn:schemas-microsoft-com:office:smarttags" />Wales. 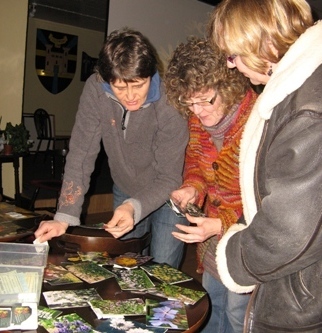 Photo shows 'Close Encounters With Plants' workshop with microscopes. Other titles will be available in the future. I’m currently considering ‘Slugproof Plants’, Absolutely Bloomin’ Marvelous!’, ‘Edible Flowers’, ‘Climbers’, 'Great Gardens', ‘Plant Common Names’, ‘Eat your Garden!’, ‘A Year in the National Botanic Garden of Wales’; ‘A Walk around the National Botanic Garden of Wales’, ‘A Personal View of Swansea Botanical Complex’, ‘The Fragrant Garden’, ‘The Wildflowers of Gower’, ‘Clyne Valley and its Wild Flowers’ and also a ‘magasine’ format meeting consisting of smaller ‘talks’, likely to include wild flowers, a great garden or two, something botanical and something on insects. Do ask for them, it may encourage me to get them ready! At all talks Carrie will bring seeds to sell, often at discounted prices. Obviously she is unable to bring the whole selection as shown on this website, however if anyone from your Group wishes to pre-order seeds, she will bring the orders along to the meeting. At suitable times of the year there will also be plants available.